I’ve been wanting to read The Faraway Nearby for myself ever since I helped edit the fine review of it that Victoria Olsen wrote for Open Letters. In her review, she describes it as “an experiment in digressive form” and also as a “book constructed as a spiral” — what could that really mean, I wondered when I first read her piece. I’m not usually attracted to books that are either particularly experimental or deliberately digressive, but Victoria’s review (itself written in an evocatively associative way) made The Faraway Nearby sound very appealing by emphasizing Solnit’s interest in the stories we tell and how they help us create or understand connections. I went back to reread Victoria’s review after I finished The Faraway Nearby, and I have little to add to her analysis of its strengths and weaknesses, so if you want to know more about them, hop on over and read her first! I am perhaps a bit less impressed with Solnit’s actual writing than she is (and not just she but many reviewers — there are three full pages of blurbiage in my edition rhapsodizing about her “gorgeous” “graceful” “dazzling” “lush” “sumptuous” prose) — though this may be because her sentences, like the book itself, are meandering and exploratory rather than polished and purposeful, which, again, isn’t usually my thing. Reading them (and it), I wasn’t always sure where we were going, which is something I tolerate in my reading in direct proportion to my confidence in the writer’s overall control. Is Solnit always in control? I wasn’t convinced. Take this sentence, for instance: “Or rather writing is saying to the no one who may eventually be the reader those things one has no someone to whom to say them.” Is it just me or is that a mess? But there were also lots of passages I liked a lot, such as the one about libraries I quoted from last time, and the other pages in its vicinity about reading: “a book is a heart that only beats in the chest of another” (though shouldn’t it be “beats only” instead of “only beats”?). Apricots, Iceland, Frankenstein, Arctic explorers, leprosy: as long as I could relax and just follow her where she went, I was almost always interested, even if I sometimes found myself pausing, perplexed, because I couldn’t remember the path we had traveled to arrive at our current location. In that respect the essayist she reminded me of the most was Woolf, except that in A Room of One’s Own (vivid in my reading memory right now because I just taught it) a specific argument is made emphatically at the beginning of the book and everything else is logically (though not linearly) in pursuit of it. Solnit’s governing ideas are themselves more fluid, and thus her stream-of-consciousness method ultimately diffuses rather than focuses our attention — or, at any rate, my attention. Prompted by her observations, experiences, and descriptions, my own mind often wandered off to my own life, or reading, or family, or travels, and I had to bring myself deliberately back. I don’t think Solnit would be dissatisfied with that, as if she has a thesis, it’s that stories move between us and link us, and shape our understanding, of ourselves and of others, in just that way. Something I found myself wondering about a lot as I read The Faraway Nearby was where the authority comes from to write in this genre, whatever it is. It’s not exactly a memoir, though it might be right to call it “life writing” (I would actually have liked it if it were a more conventional autobiography, as I got very caught up in the more linear sections about her mother’s dementia and her own cancer). It’s not exactly travel writing, though sections of it are (she writes wonderfully about Iceland). It’s not philosophy, at least not in any way a professional philosopher would recognize, but its parts are woven together with writing I might call “philosophical” in the informal or colloquial use of that word: reflections on what things mean and what is important, not just for Solnit but in general. The moment when mortality, ephemerality, uncertainty, suffering, or the possibility of change arrives can split a life in two. Facts and ideas we might have heard a thousand times assume a vivid, urgent, felt reality. We knew them then, but they matter now. They are like guests that suddenly speak up and make demands upon us; sometimes they appear as guides, sometimes they just wreck what came before or shove us out the door. We answer them, when we answer, with how we lead our lives. Sometimes what begins as bad news prompts the true path of a life, a disruptive visitor that might be thanked only later. Most of us don’t change until we have to, and crisis is often what obliges us to do so. Crises are often resolved only through a new identity and new purpose, whether it’s that of a nation or a single human being. which is as different from what we call knowing it, as the vision of waters upon the earth is different from the delirious vision of the water which cannot be had to cool the burning tongue. When the commonplace ‘We must all die’ transforms itself suddenly into the acute consciousness ‘I must die — and soon,’ then death grapples us, and his fingers are cruel. Maybe one of the reasons I did not find Solnit’s version of this idea especially compelling is that, knowing Eliot’s so well, Solnit’s proffered insight struck me as unoriginal. It’s also more abstract: it emerges from her recounting of the story of Che Guevara, but its idea is immediately diffused across other stories, while Eliot uses her appeal to our shared experience as a means of making us feel all the more intensely the mental agonies of Mr. Casaubon (which is, in turn, part of her larger agenda of training us in empathy, which is also one of Solnit’s intermittent interests). Both passages are overtly written, but Eliot’s metaphors are more concrete and surprising. I don’t think I could necessarily make a convincing case, though, for why I read Eliot’s philosophizing as more profound or authoritative than Solnit’s. (I did have a much easier time with Solnit in this regard than I did with Cheryl Strayed, whose Tiny Beautiful Things annoyed me so much I couldn’t finish it.) Am I underestimating Solnit’s gravitas because of the comparative ease and looseness of her writing, which made it seem (mostly) artful but not truly deep? Or is there a genuine difference of quality, of substance, between her elegant reiteration of fairly commonplace ideas and Eliot’s sustained attempt to dramatize a system of ethics, a theory of history, a human place in nature? (I realize that’s not a particularly neutral way to put the question!) 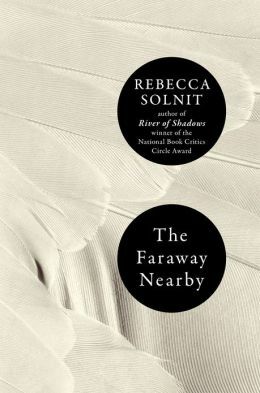 Solnit’s section on leprosy includes many fascinating and thought-provoking observations, but once she turns to using the disease as a metaphor, it becomes banal: “If numbness contracts the boundaries of the self, empathy expands it.” Why do I not feel the same dissatisfaction with the pier glass passage in Chapter 27? Is it just the accumulated deference and admiration of long acquaintance with its author that makes it so much more interesting to me? If I knew Solnit better — if I had been reading her longer — would I hear the same rich authority in her pronouncements? It is only by putting it into words that I make it whole. This wholeness means that it has lost its power to hurt me; it gives me, perhaps because by doing so I take away the pain, a great delight to put the severed parts together. Perhaps this is the strongest pleasure known to me. It is the rapture I get when in writing I seem to be discovering what belongs to what. . . . From this I reach what I might call a philosophy; at any rate it is a constant idea of mine; that behind the cotton wool is hidden a pattern; that we — I mean all human beings — are connected with this; that the whole world is a work of art; that we are parts of the work of art. Compare this, from Solnit’s follow-up commentary: “Stories like yours and worse than yours are all around, and your suffering won’t mark you out as special, though your response to it might.” Isn’t that a letdown, even rhythmically? But it’s a lot to ask of a writer, that they withstand comparison to Eliot and Woolf. Previous Article Shhh! It’s (Still) A Library! Well, it’s not just you. I mean, “Most of us don’t change until we have to, and crisis is often what obliges us to do so.” A banal insight in banal prose. Nice to see Tom out and about! I was very interested in reading your review as this book is one on my toppling pile of must-read-before-end-of-June. I have heard great things about Solnit but never read her. However, my tolerance of banal ideas gussied up in lyrical language is very low – so we shall see what happens! I will be very interested in your response. You and I both like ‘Gift from the Sea,’ which blends personal experience with wisdom — but I wonder perhaps if the scale or tone there is more humble (e.g. ‘here’s what I figured out from this’) so it didn’t raise the same questions for me about authority. I did like quite a lot of things about this book, just not quite the whole package.